It can't compose a sonnet. It will never win the Nobel prize for physics. But what is sometimes referred to as the body's "second brain" could be one of the evolutionary advantages that allowed higher brain function to develop in humans. Offloading operations of much of the routine functions of the digestive system and related organs to the enteric nervous system gave the cranium space for expanding areas of the brain that would power higher thought, imagination, creativity and emotion. From the esophagus on down, tissue lining the digestive system has about as many neurons as the brain of an average cat. "There are more neurons there than in the spine, and that's only the beginning. The digestive system is also rich in glial cells. 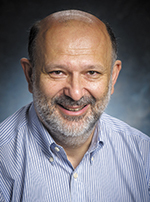 If there is disruption in communication with the brain or spine, the enteric nervous system can continue to operate independently, keeping motility and other digestive functions going," said Vladimir Papura MD, PhD, and president-elect of the American Society for Neurochemistry. Papura studies glial cell biology and nanoscience at UAB, where he is working to understand the role of enteric glial cells to answer basic questions about how glial dysfunctions may be contributing to serious disorders in both the digestive system and the brain itself. "Glial cells were once thought of as simply being there to support neural cells, but there is far more going on. Half of our brain is glial cells. In learning more about them, we may find that this is where some of the problems we've been trying to solve begin. Through this work, we hope to identify new targets for treatment of not only digestive diseases but also neurogenerative disorders, Alzheimer's Disease and gliomas," Parpura said. Anyone who has ever had a case of butterflies or felt queasy before making a speech knows that the brain can affect the digestive system. Could that interaction go both ways? Could what is going on in the digestive system affect emotions, mental functions and neurological health? Research at Johns Hopkins suggests that the anxiety and depression often found in IBS patients and previously thought to contribute to the condition might actually be the other way around--irritation in the gastrointestinal tract may be sending signals to the central nervous system that trigger mood changes. This connectedness between the enteric and central nervous system could help to explain why antidepressants can be effective in treating some digestive system disorders. More than 30 neurotransmitters are found in the enteric nervous system, and 95 percent of the body's serotonin is located in the digestive tract. Adding to the complexity of this chemistry are neurotransmitters produced by bacteria in the gut's rich and diverse microbiome, which itself seems to play a major role in the regulation of inflammation and immunity. Poor gut health is associated with a number of neurological, neurodegenerative and neuropsychiatric disorders. Research is underway to look for possible links to MS, Parkinson's, autism, anxiety and depression. Much of the research to date has been in animal models. When gut bacteria from anxious humans was transplanted into germ-free mice, the mice began to exhibit symptoms of anxiety. In a Canadian study following up on severe digestive system disturbances in a town where drinking water was contaminated by a flood, investigators noted a correlation between those who developed chronic IBS and psychiatric symptoms of anxiety or depression. Some studies have even suggested that food choices can have an effect on the brain, possibly by supporting different flora in the microbiome. A study reported in Gastroenterology showed fMRI changes in brain activity after the ingestion of a fermented milk product. At this point, research into the interplay between the brain, "second brain" and the gut microbiome in health and disease is only in its pioneering stages. Findings so far are offering tantalizing glimpses of possibilities that could help us better understand the body-mind connection. The digestive system's neurons, glial cells and millions of microbes could also one day help us identify new targets for intercepting disease processes and eventually guide us toward new treatments for a host of both physical and mental disorders. As for now, if you have a gut feeling about something, you may want to go with it. The body has its own wisdom.